The collapse of the European communism shocked the international system. In that perilous moment, Germany reunified, Saddam Hussein chose to invade Kuwait, China cracked down on pro-democracy protesters, the Soviet Union ceased to exist, and regimes throughout Eastern Europe teetered between democratic change and new authoritarians. Facing more international crises in his single White House term than any Oval Office occupant since Franklin Roosevelt at the height of World War II, George H.W. Bush faced a world in turmoil that might easily have tipped into an epic crisis. It did not, in large measure because of his quiet recognition that tense moments required calm words and that international crises are best handled behind closed doors. 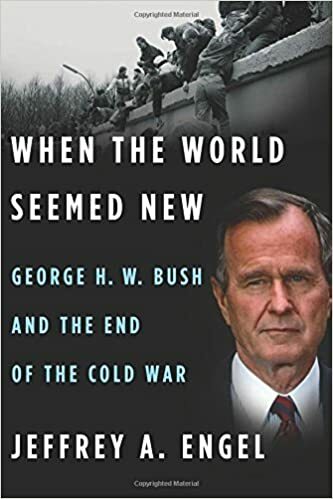 Bush did not end the Cold War. No single person did. But he did as much as anyone to keep its end surprisingly peaceful. Jeffrey Engel is the founding director of the Center for Presidential History at Southern Methodist University. Educated at Cornell, Oxford, the University of Wisconsin and Yale University, he is author or editor of ten books on American foreign policy and the American presidency, including Cold War at 30,000 Feet: The Anglo-American Fight for Aviation Supremacy (Harvard University Press) which received the American Historical Association's Paul Birdsall Prize, and Local Consequences of the Global Cold War (Woodrow Wilson Center Press). The Washington History Seminar is co-chaired by Eric Arnesen (George Washington University) and Christian Ostermann (Woodrow Wilson Center) and is sponsored jointly by the National History Center of the American Historical Association and the Wilson Center's History and Public Policy Program. It meets weekly during the academic year. The seminar thanks the Society for Historians of American Foreign Relations and the George Washington University History Department for their support. © Copyright 2017, The Woodrow Wilson International Center for Scholars, All Rights Reserved.